Following a joint blogosphere drafting effort, here’s a revised draft indictment of Bush for torture. As before, this does not attempt to include the vast majority of Bush’s crimes or any of Bush’s worst crimes. Nor does it attempt to indict the vast majority of those probably guilty of conspiracy to torture. This is just Bush and just torture. 1. The primary law of the United States Federal Government was set forth in the U.S. Constitution (“Constitution”), which provides that the Executive Power of the United States is vested in the President, who is also the Commander in Chief of the Armed Services. 2. 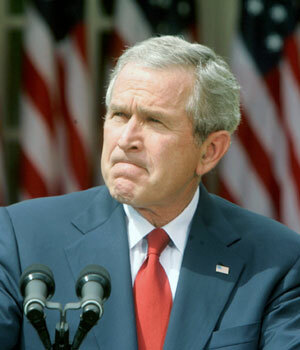 Defendant GEORGE W. BUSH (“BUSH”) served as President of the United States from January 20, 2001, to January 20, 2009. BUSH took a constitutionally mandated oath to faithfully execute the Office of President and to preserve, protect, and defend the Constitution. BUSH is also constitutionally obligated to take care that the laws be faithfully executed. 3. As Chief Executive, BUSH exercised authority, direction, and control over the entire Executive Branch, which includes the White House, the Office of the Vice President, the Departments of State, Defense, and others, and the Central Intelligence Agency. 4. As an employee of the Executive Branch, BUSH was governed by Executive Orders 12674 and 12731. These Orders provide that Executive Branch employees hold their positions as a public trust and that the American people have a right to expect that they will fulfill that trust in accordance with certain ethical standards and principles. These include abiding by the Constitution and laws of the United States, as well as not using their offices to further private goals and interests. 5. Pursuant to the Constitution, his oath of office, his status as Executive Branch employee, and his presence in the United States, BUSH is required to obey Amendment VIII of the Constitution which prohibits the infliction of cruel and unusual punishment; as well as treaties which under Article VI of the Constitution are the supreme law of the land, including the Universal Declaration of Human Rights which prohibits torture or cruel, inhuman, or degrading treatment or punishment; the Third Geneva Convention relative to the Treatment of Prisoners of War, the Fourth Geneva Convention relative to the Protection of Civilian Persons in Time of War, and Common Article 3 of the Geneva Conventions which prohibits violence to life and person, in particular murder of all kinds, mutilation, cruel treatment and torture, as well as outrages upon personal dignity, in particular, humiliating and degrading treatment; the International Covenant on Civil and Political Rights which prohibits torture or cruel, inhuman, or degrading treatment or punishment; the Convention Against Torture and Other Cruel Inhuman or Degrading Treatment or Punishment which requires that the United States work to prevent all forms of torture; as well as Title 18, United States Code, Section 2340A which prohibits conspiring to torture; and Title 18, United States Code, Section 2441 which prohibits conspiring to torture or inflict cruel or inhuman treatment or murder. 6. As used in Section 2340A, the term “torture” means an act committed by a person acting under the color of law specifically intended to inflict severe physical or mental pain or suffering (other than pain or suffering incidental to lawful sanctions) upon another person within his custody or physical control; “severe mental pain or suffering” means the prolonged mental harm caused by or resulting from — (A) the intentional infliction or threatened infliction of severe physical pain or suffering; (B) the administration or application, or threatened administration or application, of mind-altering substances or other procedures calculated to disrupt profoundly the senses or the personality; (C) the threat of imminent death; or (D) the threat that another person will imminently be subjected to death, severe physical pain or suffering, or the administration or application of mind-altering substances or other procedures calculated to disrupt profoundly the senses or personality. 7. As used in Section 2441, the term “torture” means the act of a person who commits, or conspires or attempts to commit, an act specifically intended to inflict severe physical or mental pain or suffering (other than pain or suffering incidental to lawful sanctions) upon another person within his custody or physical control for the purpose of obtaining information or a confession, punishment, intimidation, coercion, or any reason based on discrimination of any kind. 8. As used in Section 2441, the term “cruel or inhuman treatment” means the act of a person who commits, or conspires or attempts to commit, an act intended to inflict severe or serious physical or mental pain or suffering (other than pain or suffering incidental to lawful sanctions), including serious physical abuse, upon another within his custody or control. 9. As used in Section 2441, the term “murder” means the act of a person who intentionally kills, or conspires or attempts to kill, or kills whether intentionally or unintentionally in the course of committing any other offense under this subsection, one or more persons taking no active part in the hostilities, including those placed out of combat by sickness, wounds, detention, or any other cause. 1. On Sept. 17, 2001, BUSH produced an executive order authorizing the CIA to set up unacknowledged detention facilities around the world. For years after this date, prisoners in these facilities were not identified to the International Committee of the Red Cross or provided due process. 2. On January 25, 2002, the White House Legal Counsel Alberto Gonzales produced a Memorandum for the President on the subject of “Decision Re Application of the Geneva Convention on Prisoners of War to the Conflict With Al Qaeda and the Taliban.” In this memorandum, Gonzales stated that he had advised BUSH on January 18th that “the Department of Justice had issued a formal legal opinion concluding that the Geneva Convention III on the Treatment of Prisoners of War (GPW) does not apply to the conflict with al Qaeda,” and that “DOJ’s opinion concludes that there are reasonable grounds for you to conclude that GPW does not apply with respect to the conflict with the Taliban.” Gonzales stated that BUSH drew that conclusion: “I understand that you decided that GPW does not apply and, accordingly, that al Qaeda and Taliban detainees are not prisoners of war under the GPW.” Gonzales reported that the Secretary of State, Colin Powell, had requested that the president reconsider his decision. Gonzales advised BUSH that a positive consequence of adhering to his earlier determination was that it “substantially reduces the threat of domestic criminal prosecution under the War Crimes Act (18 U.S.C. 2441).” Negative consequences listed by Gonzales included: “The War Crimes Act could not be used against the enemy,” and “Concluding that the Geneva Convention does not apply may encourage other countries to look for technical ‘loopholes’ in future conflicts to conclude that they are not bound by GPW either.” Gonzales recommended that BUSH not reconsider his decision. 4. On June 29, 2006, the United States Supreme Court ruled in Hamdan v. Rumsfeld that the Geneva Convention applies to prisoners held under BUSH’s command at Guantanamo Bay. 5. BUSH’s subordinates, through the years of his presidency, established an official policy of torture, and cruel and inhuman treatment. The CIA produced secret guidelines authorizing torture. The Office of Legal Counsel in the Department of Justice produced secret opinions authorizing torture. 6. BUSH’s subordinates engaged in the widespread use of officially sanctioned torture. Incidents of torture, cruel and inhuman treatment, and murder by torture are extensively documented, including by a February 2007 International Committee of the Red Cross Report on the Treatment of Fourteen ‘High Value Detainees’ in CIA Custody. 12. BUSH never voluntarily made public what he knew about torture, cruel and inhuman treatment, or murder by his subordinates. Instead, for years, he publicly denied that the United States ever used torture. When evidence of torture was made public, including photographs from Abu Ghraib prison in Iraq made public in 2004, BUSH did not investigate the problem, remove those responsible from office, or punish them. The military convicted several low-ranking soldiers, but did not pursue responsibility up the chain of command. 1. On February 7, 2002, BUSH produced a Memorandum for the Vice President, the Secretary of State, the Secretary of Defense, the Attorney General, Chief of Staff to the President, Director of Central Intelligence, Assistant to the President for National Security Affairs, and Chairman of the Joint Chiefs of Staff on the subject of “Humane Treatment of al Qaeda and Taliban Detainees.” In this Memorandum, BUSH denied rights protected by the Geneva Conventions to certain categories of prisoners. 2. On December 30, 2005, BUSH signed a signing statement, “President’s Statement on Signing of H.R. 2863,” in which he claimed the power to ignore a new prohibition on torture contained in the bill he had just signed into law. 3. BUSH personally authorized the torture of Khalid Sheikh Mohammed and authorized meetings by his top subordinates at which they approved the torture of other prisoners. All in violation of Title 18, United States Code, Sections 2340A and 2441.